MapleStory 2 launches on Oct. 10, but that doesn’t mean you can’t start getting loot now! Pre-registration has officially opened, letting prospective players reserve their spot in the game and pick up some bonus items to match. 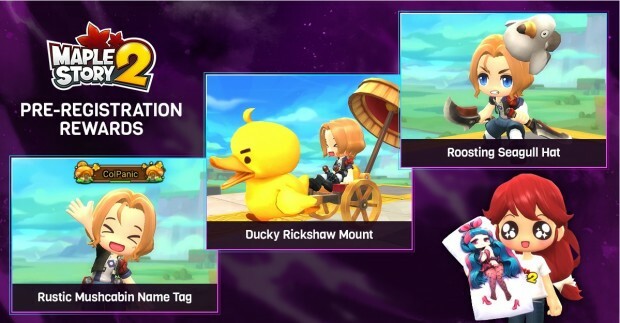 From now until Oct. 8, head on over to the MS2 site and register to receive the Roosting Seagull, Rustic Mushcabin Name Tag, and the Dusty Rickshaw as in-game items once the game launches. If you’ve purchased a Founder’s Pack, you can get into the game even earlier than the Oct. 10 launch, jumping in on the first of the month and making use of premium time, various cosmetic items, and a Prismatic Harmony Unicorn. A unicorn! You’ll also get the chance to try out all the game’s jobs: Archer, Assassin, Berserker, Heavy Gunner, Knight, Priest, Thief, and Wizard, with your progress carrying over to launch. Other new stuff that beta players will enjoy upon the game’s launch are a new region, Karkar Island, new class, Runeblade, and a level cap increase. All of those sound like things a game does after it launches, but what do I know?